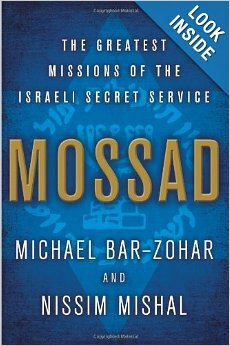 Mossad: The Greatest Missions of the Israeli Secret Service, by Michael Bar Zohar and Nissim Mishal, 388 pages, Harper Collins Books 2012. I know that this book is already two years old, but I only just read it. I’m hoping to get people to let me have advance copies of books so that I can write more timely reviews. Mossad is a collection of more than twenty true stories about operations conducted by Israel’s spy services since 1948. Do not look for new information here. If you are already well read on declassified Mossad missions then this book is not for you. But if you are not and want to learn more, than this is an excellent, concise summation of some of the most important and most renowned activities of the Mossad in the last sixty years. Established soon after independence, the Mossad is the Israeli C.I.A. It has engaged in a myriad of activities from assassinating wanted Nazi war criminals and terrorist leaders to aiding Jews from countries such as Ethiopia and Syria come to Israel. Mossad literally means institute and is short for “Mossad Lamodiyin Vilatafkidim Meyuchadim” – The Institute for Intelligence and Special Operations. For almost fifty years its leaders and its very location in Israel were state secrets to protect the Mossad’s clandestine operations. Unlike in America where everyone knew of the C.I.A. headquarters in Langley Virginia and the identity of its director at any given time, here in Israel we did not know either about the Mossad. This all changed after the Rabin assassination in 1995 and a public call by Israelis for more transparency from their government. The book opens with a story of how Israeli army commandoes assassinated the leader of the Popular Front for the Liberation of Palestine in 1971 in the Gaza Strip. Even though Gaza was under Israel’s complete control at the time, Abu-Seif managed to elude capture. A group of elite soldiers entered Gaza from the sea posing as Arab terrorists from Lebanon who came to help the PFLP. When they were brought to meet Abu-Seif they killed him and all of his people in the room. This was not a Mossad operation, but the elite soldiers who led the mission went on to become leaders in the Mossad. Many Mossad agents came out of elite I.D.F. units. The book is written largely in chronological order with a few exceptions. For example, a chapter about the secret planning which brought the Jews of Ethiopia to Israel over a fifteen year period in several operations comes at the end of the book after stories about events that succeeded it. I am also not sure why they chose to include the chapter titled “Saddam’s Supergun” in the book at all. This chapter tells the story of Gerald Bull, a Canadian scientist who dreamed of making a super gun that could launch satellites and space ships into space. This gun could replace costlier rockets. But after working for the American government in the 1960’s his dreams were dashed when the Americans decided not to pursue the project. By the 1980’s Gerald Bull had designed weapons for many countries including Israel. He helped Israel to improve its artillery. But then he agreed to make his super gun for the Iraqis who intended to us it as a weapon. With a range of more than a thousand miles it could carry ridiculously large shells that would threaten Tel Aviv. Fortunately, the gun was not completed before the Gulf war in 1991. On March 22, 1990, Gerald Bull was assassinated in Brussels. This ended his work on the gun and the last parts for it were confiscated by European customs agents before they were ever shipped to Iraq. But this gun would not really have made an effective weapon. It was so large and massive that it needed to be propped up on a hill side and could not be redirected towards other targets easily. New missiles and drones made it obsolete. Also, its size and stationary nature made it vulnerable to an air attack. It is doubtful that the super gun would ever have been useful. That is part of the reason why I do not understand why this chapter was included in the book. The authors state that while there was a great deal of speculation about who killed Bull “most observers agreed on Israel,” but why? The chapter does not mention the Mossad and many countries’ intelligence agencies were investigating Bull at the time. It was no secret that he was making a weapon for the Iraqis. There was speculation that both the British and Americans wanted Bull to make the gun for Iraq because Iraq was at war with Iran at the time and the West was supporting Iraq in that war. But the Iran/Iraq War had ended before Bull’s death so maybe they decided that it was no longer a good idea to let the Iraqis have the gun. There were also a number of countries other than Israel, such as Iran and Iraq itself, that might have wanted Bull dead. The point is simply that the Gerald Bull story is not really related to the Mossad. A number of excellent books have been written about Gerald Bull. HBO even made a movie about him in 1994 called “Doomsday Gun” with Frank Langella as Bull, Kevin Spacey as a C.I.A. agent and friend of Bull’s and Alan Arkin as a Mossad agent who tried to stop Bull. For some reason the authors chose to add two more stories to the chapter about Bull; even though, these stories have nothing to do with Bull and his gun. It is kind of like the division of the Tora into its weekly portions where stories are not in chronological order and some to begin before the end of one portion and then finish only the following week. Bull’s chapter continues with the story of the assassination of the head of the Popular Front for the Liberation of Palestine, Wadie Haddad, in Damascus with a box of poisoned chocolates. It ends with assassination of the Islamic Jihad leader Abdel Shkaki in Malta in October 1995. Mossad also deals with some of the organization’s failures. One was the attempted assassination of Hamas leader Khalid Mishal in Amman Jordan in 1997. The two Mossad agents who attempted to kill Mishal botched the job when they sprayed a slow acting poison in Mishal’s ear on an Amman Street. One of Mishal’s men saw the two and chased them. The two agents were arrested by the Jordanian police and were discovered to have been traveling on false Canadian passports. This was one of a string of high profile failures of the Mossad in the late 1990’s. A joke at the time held that a known Arab terrorist was successfully assassinated and no one in the world blamed Israel for it because nothing went wrong. President Clinton and King Hussein were both infuriated at Israel for attempting the assassination in Jordan after Jordan had made peace with Israel. There was also foe disdain on the part of opposition leaders in Israel at the time, many of whom were in government when Yitzhak Rabin ordered the assassination of Abdel Shkaki in Malta just a few years before. Israel sent Jordan an antidote so their doctors could treat Mishal, but the doctors insisted on knowing the chemical composition of the poison itself. Israel at first refused to reveal this secret information, but under pressure from President Clinton Prime Minister Netanyahu relented. Israel also released Hamas’ leader Sheik Yassin from prison in exchange for the Jordanians releasing the Israeli agents. I suppose now that America also engages in targeted assassinations around the world and executed Osama Bin-Laden in a “friendly” country, Pakistan, without its permission then the Americans must be a bit more accepting of Israel’s having done the exact same thing for so long. Other stories in Mossad include a synopsis of what Happened to Eli Cohen, a Mossad agent who infiltrated the highest levels of the Syrian government in the 1960’s. Cohen was originally from an Arab country and so he spoke Arabic fluently. He was discovered to be a spy by the Syrians and executed by them. The book also deals with the capture of Adolph Eichmann in Argentina, the capture of Mordechai Vannunu who revealed the secret of Israel’s nuclear program to the British press and the Egyptian official who provided Israel with a wealth of information over the years including an accurate warning of Egypt’s plan to attack on Yom Kippur in 1973. Unfortunately, the powers that be in Israel refused to believe that warning. As I said, there isn’t really anything new in Mossad. Most, if not all, of what it contains has already been written about. Each chapter has at least one entire book on its subject alone. But, if you do not have the time to read twenty different books and are not already well versed in Israeli history, Mossad offers you an excellent abridged history of many very interesting and exciting true stories about Israel’s spy agency. Next Story → Kotel, Palestine? We Make Sure The Number Of Buns And Franks Don’t Match. We’re The Mossad.